Lock in a great price for Hotel Bellevue Wien – rated 8.3 by recent guests! The breakfast bar was great & the room meet all my expectations. The staff was also very friendly. Room is spacious and clean. Bed was really comfortable for me. Good size shower. Breakfast was very good. Staff is really nice. Nice breakfast, large rooms, our room was facing the street but it's not busy so it wasn't noisy. the room is very spacious and nicely decorated. the hotel's location is great. Arriving from the airport is easy. You can buy 24/48/72 hours ticket (which can be used for all public transportation in the city center) and only pay 1,8 eur for one-way additional fee for using it in airportline (S7). The best way from the airport to the hotel is by the train S7 to Landstaße- Wien Mitte. There you change to the metro U4 . 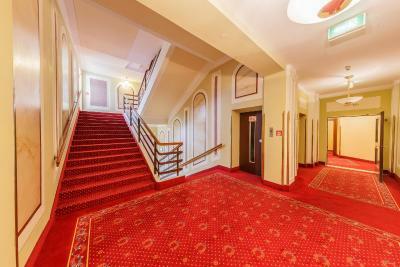 Get off at Friedensbrücke and you will find the hotel in 5 Minutes walking distances. the staff working in the breakfast area are definitely perfect. Breakfast is good and sufficent. I don't remeber requesting hair from the previous person in my bed. Maybe it used to be a 4 star hotel, but it's not the case anymore. Old furniture, old beds, the walls are dirty. The bathroom it's ok, but not great. The internet is horrible. Beautiful and elegant looking hotel with cheery, friendly staff that were more than happy to help. Near more than one city bike stations that made getting around the city very enjoyable. Breakfast was a true feast, and made a great start to the morning. The air conditioning made the night's sleep perfectly comfortable, and the room was made spotless. The bartender at this property, Yasser is a very exceptional person. When one returns from a day of touring the city, one can look forward to the evening's entertainment: food and drinks with Yasser. Give him a raise!! Breakfast was pretty good and it had vegetarian and vegan options but more choice for vegeratians and meat eaters. I found the treats in the room a bit decieving as there were no prices attached to them and was advised by reception that theyre not free but they could haVE easily been mistaken as gifts. The hotel was quite lavishly designed with high ceiling and quite posh arrangements. Staff was very polite and very helpful, restaurant was good and so was the included breakfast. Close to supermarket and public transport. 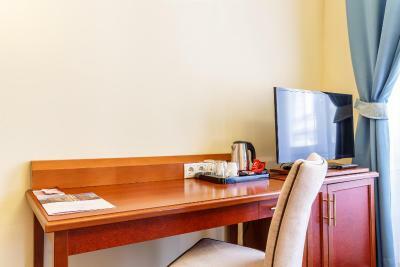 Hotel Bellevue Wien This rating is a reflection of how the property compares to the industry standard when it comes to price, facilities and services available. It's based on a self-evaluation by the property. Use this rating to help choose your stay! 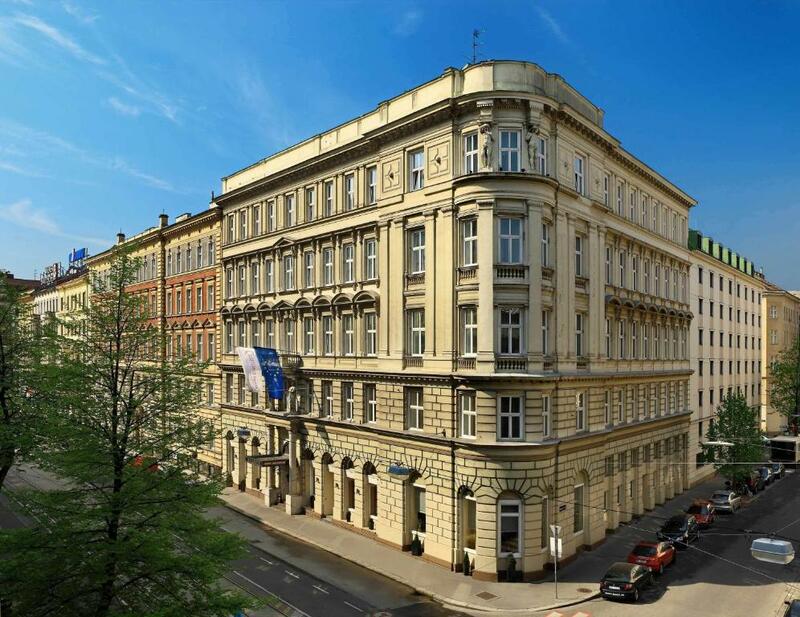 Just a 10-minute ride on tram line D or on the U4 metro line from the very center of Vienna, Hotel Bellevue Wien occupies a historic building dating from the end of the 19th century and offers you air-conditioned rooms, free WiFi and a restaurant. The hotel has been entirely renovated in 2016. Free WiFi is available. The spacious rooms come with a bathtub or shower and coffee and tea making facilities. Hotel Bellevue's restaurant serves Viennese specialties and international cuisine. The Liechtenstein Palace with its Baroque garden and its collection of Renaissance and Baroque paintings is just a few steps away. Within a 10-minute walk you can reach the huge Augarten Park. 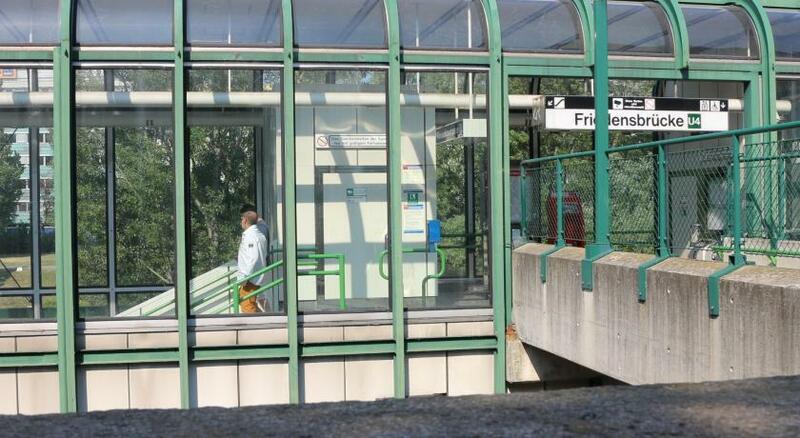 Within a 5-minute walk you can reach the Friedensbrücke stop of the U4 metro line, offering direct connections to Schönbrunn Palace and to the center of Vienna. Tram line D stops just around the corner and also get's you to the center in 10 minutes. 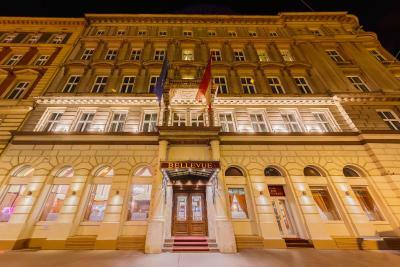 When would you like to stay at Hotel Bellevue Wien? These bright and spacious rooms are modernly furnished and come with a bathtub or shower, air conditioning, free WiFi. This is a large room with a high ceiling located in the historical part of the hotel, featuring wooden furniture and blue and pastel tones. House Rules Hotel Bellevue Wien takes special requests – add in the next step! Hotel Bellevue Wien accepts these cards and reserves the right to temporarily hold an amount prior to arrival. Please inform Hotel Bellevue Wien of your expected arrival time in advance. You can use the Special Requests box when booking, or contact the property directly using the contact details in your confirmation. Parking/garage was not available. The information on booking.com concerning parking was not accurate. If the toilet instruments a bidet, it would be better, though it is just a personal impression. Great location (5 minutes walk from U4 station), excellent breakfast (though a little bit clouded), friendly staffs. The heating did not work.It was a cold night . The bathroom: shower and sink locations with difficult access, you have to get into a small bathtub to get access to the shower that is fixed in an impossible to adjust shoulder level. The room had strange smell. Stains on the carpet. In general, quite shabby and not what you expect from a four star hotel. The location is quiet and not far away from the heart of the city. Value for money: Considering that the hotel is very old with very old furniture, the price is very high for such facility. No free parking. An evening meal can be provided up till 22.00. Menu decent. Not many hotels of this rating offer this. I was glad of it after travelling all day. Excellent location for public transport both tram and metro. There was no kettle in the room as indicated on the Booking.com website. There is a nice variety for breakfast. The bar tender was terrible with his attitude. I asked for some hot water and he acted as though I was asking him to give me a free bottle of whiskey. Fair enough, it wasn't really his responsibility but at the end of the day he works at the hotel and should have gone the extra length. Very close to subway and tram station. 10-15 min to city center. Good breakfast. Bathtub jammed, not enought light on the room, not enought plugs. Situation, breakfast buffet very good . .